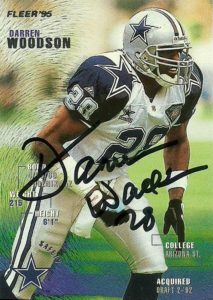 As you see on the 1992 StarPics card, Darren Woodson was originally an outside linebacker, but his skill set determined that he was a better fit at the safety position. With the emergence of Darren Woodson at safety, James Washington became expendable. That’s a tall thing to say considering James Washington’s performance for the Cowboys over the past few seasons had been exceptional- but Woodson was up to the tall order, both being a great hitter and well rounded in coverage. In 1993 he’d set a team record for defensive backs with 155 tackles from his strong safety position. Frequently he’d line up in a linebacker position (sometimes called ‘elephant’ at the college level) and unfairly cover the slot receiver. 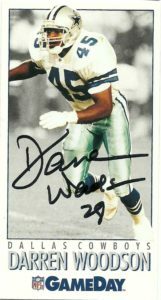 He’d be named AP in 1994, 1995 and 1996, the ProBowl from 1994 to 1998, was a SuperBowl Champion 3 times and over 12 seasons he’d become Dallas’ all-time combined leading tackler with 1350 tackles. With the retirement of Darren Woodson in 2004 (due to injury) Dallas’ secondary collapsed. In 2006 a rumored comeback was in the works, but with the Cowboys unable to make the playoffs he remained in retirement. 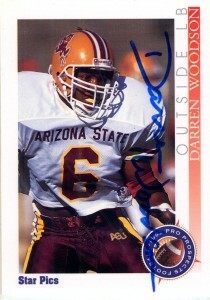 Since football Darren has been involved with ESPN and provides honest commentary about the Dallas Cowboys. Listed below is also a nice highlight reel of Darren’s hits and picks.